The US dollar is acting weak against EUR and today German Prelim GDP and the Eurozone flash GDP will bring some volatility to the market. 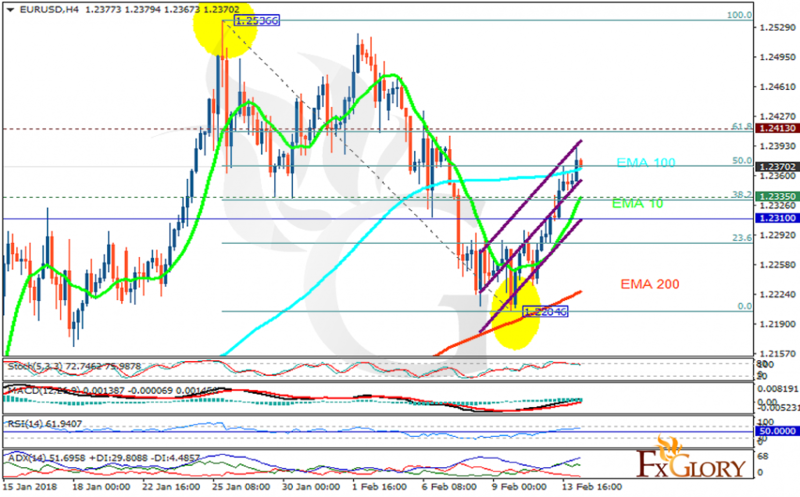 The support rests at 1.23350 with resistance at 1.24130 which both lines are located above the weekly pivot point at 1.23100. The EMA of 10 is moving with bullish bias in the ascendant channel and it is above the EMA of 200 and below the EMA of 100. The RSI is moving in overbought area, the Stochastic is moving in high ranges and the MACD line is above the signal line in the positive territory. The ADX is showing buy signal. Long positions are recommended towards 61.8 level of Fibonacci at 1.24.